I just finished leafing through the latest issue and it is fantastic! 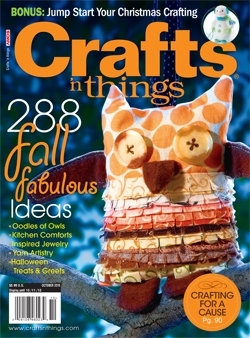 From the adorable owl on the cover above, to Melony Bradley’s awesome autumn tea towel tutorial, to a sweet needle‐felted snowman from Debra Quartermain, the magazine is packed with inspiration. Find the directions for my Halloween Treat Bags made with felt and a Sizzix ScoreBoards die on page 9.